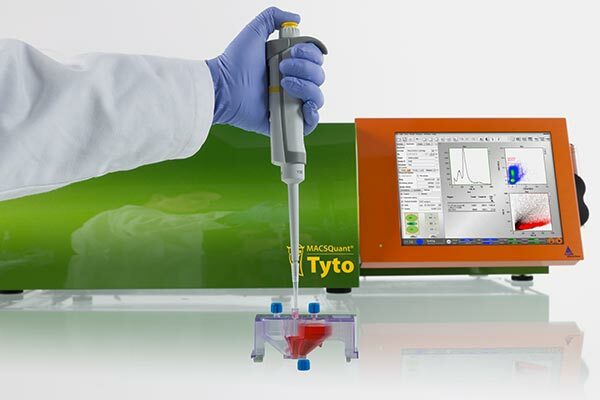 Overview – The MACSQuant® Tyto® is revolutionizing cell sorting with high-speed, 10-parameter cell sorting in a fully closed cartridge system, the Tyto cartridge. With its easy “plug and play” format and fully automated laser alignment, this innovative microfluidic flow sorter makes cell sorting accessible to any lab professional. Additionally, the closed Tyto cartridge provides full operator safety and protects the cell sample from contamination. 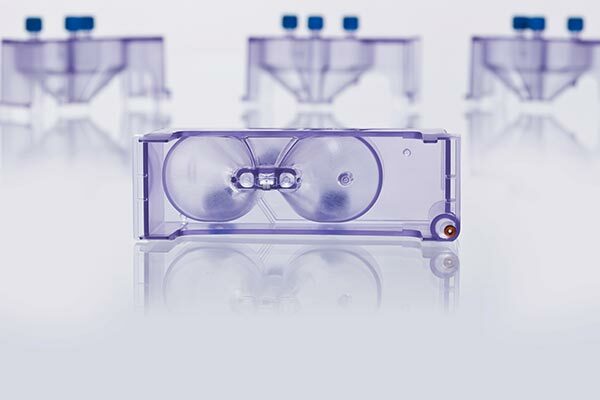 The MACSQuant Tyto is revolutionizing cell sorting. Our patented microchip-based technology opens up new possibilities in basic research and medical applications with high-speed multi-parameter flow sorting in the safety of a fully enclosed cartridge system, the MACSQuant Tyto cartridge. This is the new MACSQuant Tyto disposable cartridge. There are three floating chambers which can be accessed from above to input positive and negative selection. At the bottom of the cartridge is the heart of Tyto sorting system…Watch the Video to Learn More! 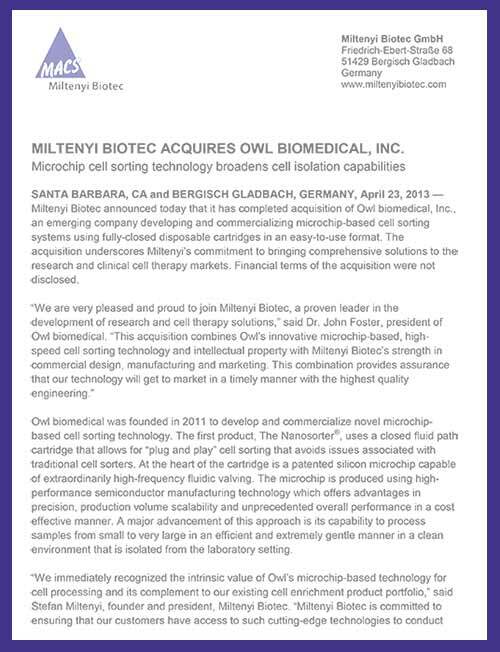 MILTENYI BIOTEC GMBH ACQUIRES OWL BIOMEDICAL, INC.
Miltenyi Biotec announced today that it has completed acquisition of Owl biomedical, Inc., an emerging company developing and commercializing microchip-based cell sorting systems using fully-closed disposable cartridges in an easy-to-use format.